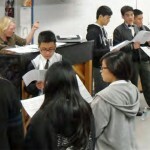 2012 – 13 Sept – June St Patrick’s Regional High School Chamber Choir & grade 8, 9, Concert Choir. “I might add a cupful of trust to my friendship recipe because…” The objective of this project is to promote the learning of friendship skills. CK News (Cool Kids News) has just learned that the winter solstice is approaching and some people are worried about the fact that there’s so little daylight. The roving reporters interview the kids at school who have researched the science, history and culture behind the winter solstice. Teaching and learning experiences are meaningful and engaging when the arts (music, dance, drama and visual arts) are integrated throughout the curriculum including literacy and numeracy learning and the voice (speaking/singing) is an instrument readily available to any classroom. I am experienced in developing music connections both as a Fine Arts Resource Teacher, Choral specialists, Music and Drama Educator and Post Secondary Instructor. You can contact me through my convenient contact form with any details you wish to discuss about the services I offer. The 30 minute musical play explores everything from sound vibrations and decibels to sound pollution and the affects on humans and the environment. All of the students have learned about sound in Science. Student # 3 (girl or boy) is the class nerd and seems to know a lot of important facts about sound. This leads to a discussion about sound pollution, the anatomy of the ear drum and how to sing in tune for the school talent show. Simon Fraser’s journey on the river named for him is one of the greatest feats in the exploration of Canada. Although Fraser along with lesser known explorers, John Stuart and Jules Quesnel, failed to find a trading route to the Pacific Ocean, their exploration helped to open up North America and the province of British Columbia. From the small trading post of Fort George, on the morning of May 22nd, 1808, Simon Fraser and his crew set out in four birch-bark canoes. Thirty minutes long, the “The Raging River” is a representation of his seventy – one day journey and raises issues including the affects of early exploration and the technologies used (transportation).